Our team recently undertook a delightful albeit challenging garden makeover, with the most rewarding outcome. Here we take you through the full story, section by section. This is the garden of a home that is just over 10 years old, and nothing has ever been changed from the initial garden layout. Growth was fairly thick, with lots of common hedges and overgrowth in place. The garden was neat but cluttered and fairly boring. Any garden makeover project like this must always start with the design. Our team poured over various design options and discussed the challenges we would have faced with each, to come up with a great new garden design for this lovely home . We started with the verge garden. When was the last time you really noticed your verge garden? As we drive past it regularly a few times a day, in and out of our driveways, it is easy to stop noticing it and allow it to become cluttered and overgrown. The verge garden however leaves a “first impression” to visitors or passers-by which cannot be undone. A cluttered, overgrown verge detracts from the beauty of the home and its perceived value. It should thus always be presentable and well-maintained. In this garden makeover, the verge was uppermost in the mind of the owner as needing a revamp, in keeping with the rest of the garden makeover design. It hadn’t been changed in many years and it became the final resting place of every “left-over” plant. The result was an enormous mixture of different plants, with no theme, with a very old-fashioned “coastal-garden” look. It also lacked any form of design. Our makeover saw a drastic change, with indigenous grasses that will grow high to bring back privacy where the hedge one was. <<< Watch our before and after video alongside. We then moved on to the entrance garden. An entrance garden, being the first element of a garden one sees when entering a property, should be a focal point that is neat and uncluttered but simultaneously attractive and interesting. When this San Lorenzo garden makeover was undertaken, the existing entrance garden was very uninteresting, with a common yellow Duranta Sheena’s Gold hedge acting as a visual border against the fence. This plant is not indigenous and is very overused. It is high maintenance, requiring regular clipping and shaping, and is not water-wise. The decision to replace it was not taken lightly however as it was a well-established hedge and whatever we replaced it with would not become established overnight. Ultimately, the home owners love for diversity and indigenous water-wise plants made the decision easier, and the hedge was removed. The compromised privacy would only be a short-term problem. Where once there was a high maintenance non-indigenous Duranta hedge, there are now low maintenance, natural-looking, water-wise indigenous shrubs which will eventually grow big enough to screen garden from the road. Once we had the entrances established, it was time to consider entertainment areas. We came up with 2 ideas – and here we feature one of them, a secluded teenage garden – a quiet space for teenagers to be at peace in a beautiful garden setting. The space was initially an awkward shaped lawn filled with scrub and hedges, of no use to anyone. Our professional design team sat in a brainstorming session, and designed a secluded small garden for the area, with the idea in mind to give the teenagers a secluded space outside but still offer privacy and get them off the couch and into the outdoors. Of course, no garden makeover would be complete without a few plant containers. Who doesn’t love a beautiful pot spilling over abundantly with tumbles of flowers and greenery? It gives an instantly fresh “spring” appeal to your living space. Pots of most sizes can easily be moved between spaces to change up any area. As they generally don’t take up a lot of space they can be used in courtyards, on patios and balconies, on pathways and in driveways. If you move, you simply take them with you. Finally, but probably the most fun we had with this garden makeover, we created a herb garden. Who doesn’t love a herb garden?! 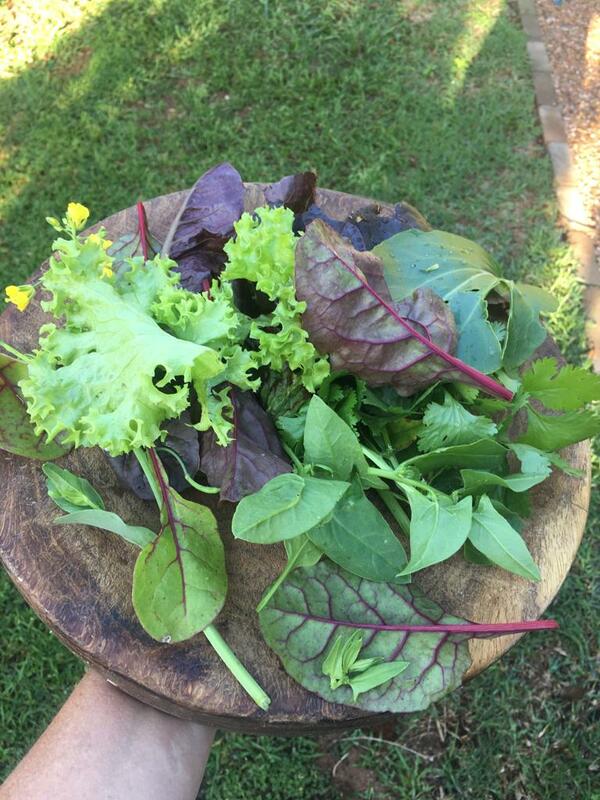 A salad never tasted so good as the one that comes out of your own homegrown produce. We believe every home needs a herb garden, regardless of whether or not you even have a garden. Herb gardens can be created on a patio, in a retaining wall, and in a variety of amazing ways with planter boxes. In this herb garden makeover project, we searched for the sunniest part of the garden. The chosen section of the garden was previously an unused patch of lawn on the north facing sunny corner of the house. The perfect spot. Garden design was key here as it was the home owners wish to not only create a delectable herb garden, but one with an eye-catching design. With this in mind, we cut a large square patch out of the lawn and used repurposed paving blocks to create 4 individual quadrants in the square. Each quadrant would hold a variety of herbs and green leafy vegetables, and the pavers would create easy access to caring for and harvesting the produce. A key element in this garden makeover, was the introduction of a rain water harvesting system. Rain Water Harvesting is quite simply the collection of rain water for use elsewhere. One of the common forms of rain water harvesting is to collect the water from the roof of a building into a storage water tank . Here we set up a DIY rainwater harvesting system with a 2500lt storage tank and a pressure pump. The water is used in this instance as irrigation water for their garden. However, harvested rainwater can have a multitude of additional uses . So as you can see, garden makeovers can be so much fun. They are like a breath of fresh air and a unique way to bring a change of scenery into your life. If you’re keen to undertake a garden makeover but not sure where to start, feel free to call in the experts for a no-obligation garden visit.